Shiraz by Gemtree of McLaren Vale. A complex web of flavours that traverse the palate. Perfect balance in wine cannot be manufactured, it occurs naturally. Hands off winemaking, purity of fruit, unfined and unfiltered, a raw gem, the uncut version. A definitive concentration of uncut Shiraz characters, yet elegant with a degree of restraint. In 1980 Paul and Jill Buttery took a punt and put all their hard earned money, with some help from the bank, into buying a vineyard on Tatachilla Road, at the heart of the McLaren Vale Wine Region. A few years later when the wine industry was struggling they bought another vineyard with land on the eastern side of the region in the foothills near McLaren Flat and called it Gemtree. They set about gradually planting the rest of the land. In 1994 their daughter Melissa was doing some extra work in the vineyard having already completed an Associate Diploma in Business from the University of SA when she decided she enjoyed grape wrangling so much she would make a career out of it. She studied to qualify as a viticulturist and now manages the Gemtree Vineyards as well as other vineyards for customers of the Terraces Vineyard Management, an offshoot of Gemtree. In 1997 Melissa's brother Andrew returned from Melbourne to manage The Terraces and in 1998 the grapegrowing Buttery family agreed to launch the Gemtree wine label. Enter Mike Brown stage left, a winemaker and boyfriend of Melissa. Having worked for a couple of years at d'Arenberg, Mike was asked by the Buttery's to make their wine. Shortly after that he asked the Buttery's, including his girlfriend, if he could marry Melissa. In 1999 Gemtree was joined part time by Helen, wife of Andrew with a background in marketing, to round off the team. Today Gemtree owns 330 acres of prime vineyard with varieties such as Shiraz, Tempranillo, Sangiovese, Merlot, Cabernet Sauvignon, Chardonnay, Petit Verdot, Cabernet Franc, Riesling, Semillon, Alborino and Verdelho. Since 1998 Gemtree has also been developing the 10 ha Gemtree Wetlands. Having created 6 dams and planted 20,000 native trees and plants they are now working in partnership with Greening Australia creating a an area of biodiversity which is a major haven for native plants, frogs, birds and animals as well as being a great teaching resource for the community. The Buttery/ Brown family is dedicated to producing interesting and appealing wines of the highest quality from their McLaren Vale vineyards. They are also passionate about sound environmental practises, sustainable agriculture and innovation. Gemtree has two vineyards. Tatachilla Road behind the township of McLaren Vale and the Gemtree Vineyard in the foothills near McLaren Flat. In 1983 Paul and Jill Buttery sunk a bore which helped improve the Tatachilla Road vineyard and then in 1987 and 1989 bought adjoining parcels of land (15 acres & 10 acres) which were planted with Semillon and Cabernet Sauvignon. Over the years some of the original vineyard was grafted to Riesling, Chardonnay and Sauvignon Blanc. The Sauvignon Blanc has since been converted back to Shiraz and in 2006 the Chardonnay was removed and replaced with 3 different clones of Shiraz. 2005 and 2006 saw some Cabernet Sauvignon grafted over to Albarino (a Spanish white variety). Having established a vineyard management business called The Terraces, Paul was engaged to establish a new vineyard in the McLaren Flat region for a group known as Viticulture 2000 Trust set up by Brian McGuigan. This property was known as Gemtree and 96 acres of Chardonnay, Cabernet Sauvignon, Shiraz and Pinot Noir were planted in 1989. In 1991 the Gemtree property was put on the market and Paul and Jill purchased it. Since then they have purchased adjoining parcels of land planting vines on it. 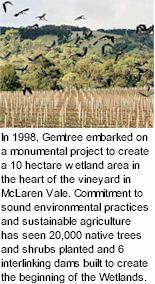 Today Gemtree Vineyards in McLaren Flat comprises 260 acres under vine planted with Chardonnay, Verdelho, Riesling, Pinot Noir, Merlot, Shiraz, Cabernet Sauvignon, Tempranillo, Petit Verdot and Sangiovese. In the vineyard, Melissa allows the vines to achieve their natural balance. An integrated pest management program encompassing minimal sprays, and canopy management, encouraging air flow and sunlight exposure, assists in prevention of disease and promotes fruit quality. The use of organic and straw mulches combined with soil moisture monitoring technology, minimises the need for irrigation and demonstrates Gemtree's commitment to sound environmental practices. Gemtree are also trialling organic practises in Petit Verdot, biodynamic practises in the Tempranillo, Albarino and Shiraz and the use of Wiltipole sheep to help reduce the weeds and keep the grass mown around the place.